We are a Sydney-based law firm who take on false arrest / unlawful imprisonment cases in all states and territories around Australia. This page contains information for people based in Queensland. If you are looking for representation in another location, please visit our main page here. O’Brien Criminal and Civil Solicitors can represent you in a civil claim against the Queensland Police Service. 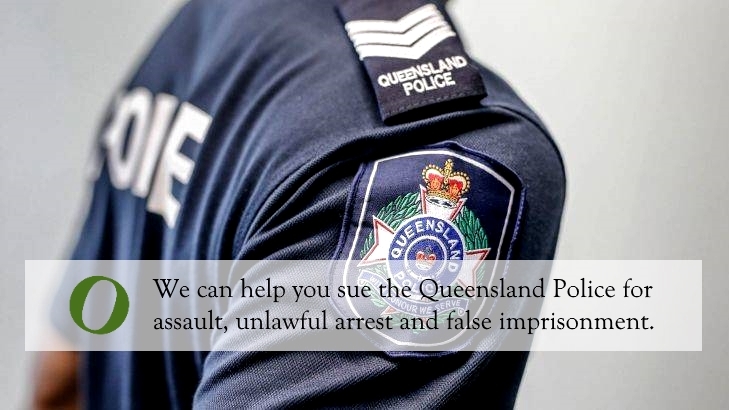 If you have been abused by the Queensland police, you may be able to sue the police for assault, battery, false arrest and unlawful imprisonment. When can you sue the Queensland Police Service? You have been arrested, charged and detained in relation to a criminal offence and these charges were later withdrawn. The Court has made a finding in your criminal matter that your arrest or detention was unlawful. This may include situations where the police arrested you using excessive force. You were arrested and detained in relation to bail or AVO conditions that were varied, dispensed with or where such conditions no longer exist. Our unlawful arrest lawyers are experienced in advising clients in Queensland. For example, we assisted KW in his claim against the Queensland Police. KW’s case was as follows. Whilst KW was going about his own business at a McDonalds restaurant in Surfers Paradise, he was approached by a police officer who spoke to him in a rude manner. He was later assaulted by the police, taken to the police station and placed in custody. He was charged with public nuisance and assault officer in execution of duty before being transferred to the Southport Holding Cells. The charges against him were eventually withdrawn. Our firm represented KW in his claim against the police which was settled. KW was paid compensation for the unlawful behaviour of the police. Read more about his case here. If you are interested in reading about the other clients that we have assisted, you can view our list of false arrest and unlawful imprisonment case studies here. Unsure about whether you might have a civil claim against the police? Speak to one of our civil solicitors who can advise you on your legal options. Call us on (02) 9261 4281 to book free first consultation.